I was doing a roast chicken and wanted a nice potato dish to go with it. But everything I looked at has masses of cream and/or butter. Shockingly bad for the diet. BUT. This dish is low-fat and tasty and relatively easy to do. It takes a little concentration but once it’s in the oven it just sits there and cooks itself, no bother. Peel the potatoes. If you have a fancy machine for slicing things thinly, such as a mandolin, then use that and slice the potatoes thinly. If, like me, you like to live by your wits, use that magical kitchen implement – a sharp knife. It’s actually suprisingly easy to thinly slice a potato. I will admit that I did have to discard the ends of the potato though, I’m not risking chopping off my fingers for the sake of a few more slices. Not even I am that dedicated. Also thinly slice the onion and garlic. Pre-heat the oven to 180/360/gas mark 5. 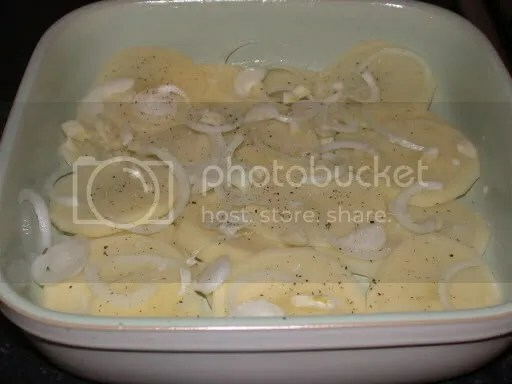 Season with salt and pepper and continue to layer the potatoes, garlic, bay and onion, ending with the potato on top. Now pour on the stock so it comes up level to the top layer of potato. I didn’t have enough stock so just topped it up with water. The world did not collapse at this improvisation, although I’m sure it would have been even nicer had I used 100% stock. Pop the dish in the oven on the highest shelf, and leave it there for about an hour. When it’s ready, it’ll be tender when prodded with a knife and collapsing into the stock. This dish is very forgiving and will stay in the oven longer if you haven’t quite timed it right. Lovely. I always cook the onions first because I find the coking time of the potato dish isn’t long enough to fully cook the onions. If you ladle a bit of the juice on top too, the potatoes on top don’t dry out too much. 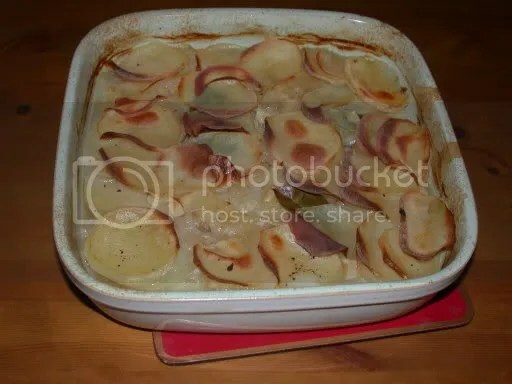 I like this recipe, because it reminds me of the classic; Potato au gratin. Or Scallop Potato. Such a lovely dish. Cooking the veggies this way, using many variations of sliced potato, carrot, cabbage, fennel, leek. Even pre-cooked winter beans or green beans. With or without a topping of bread crumb and cheese. !% Milk is my preferred cooking liquid; with chopped leek uncooked before adding, cooking liquid. Sometimes, I roast a head of garlic and use this nutty goodness instead of the raw garlic. Gotta have garlic of some sort. Lastly, that grating of fresh nutmeg …. Mmmm …mmm! Whilst I’m with you on this being a dish that doesn’t miss having cream or much butter in it, those things should never be a reason for you avoiding fat. I always like seeing someone writing something like ‘lots of fat is shockingly bad for your health,’ (this is not a direct quote from above, and I don’t in any way want to offend) because I see yet another opportunity to open the mind of a fellow human to a few diet and nutrition truths. The first, and most important, one being; fat is not your enemy. It doesn’t cause heart disease, it doesn’t clog up your arteries, and will actually only make you fat when in the presence of regular excess of calories (which, don’t get me wrong, eating a gratin potato dish with roast meat, surely will if done every day, but we don’t eat that type of calorie-heavy dish every day). I consider it part of my life-work to help bring down myths about health and well being, please let me know if I’ve started something for anyone here, my goal is to help, not be unnecessarily provocative, please let me know if I’ve crossed a line. Potato bakes- I could have a guilt free dollop of sour cream too!